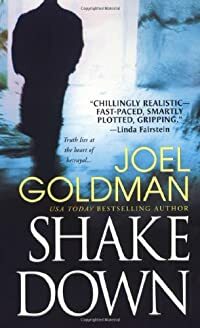 Shakedown by Joel Goldman: Synopsis and Online Purchase Options. Synopsis (from the publisher): The lives of three people collide over mass murder at a Kansas City residence that Special Agent Jack Davis has carefully staked out for weeks. Kate Scranton, whose job is spotting lies for high-priced courtroom lawyers, is convinced that mild-mannered Latrell Kelly knows something about the crime. But Latrell is hiding far more than Kate can guess. And with Jack half-blinded by an imploding personal life, and someone on his own side leaking crucial information, they're headed straight for the ultimate danger zone—where truth lies at the heart of betrayal.